Boer War Collection - British - History of the Railways during the war in South Africa. 1899-1902. You are here: Books British History of the Railways during the war in South Africa. 1899-1902. History of the Railways during the war in South Africa. 1899-1902. Printed for H.M.S.O. by Harrison and Sons. 2 Large panoramic folding photographs, folding railway map of South Africa, 4 folding diagrams, original brown card wrappers. 1903. Printed in November 1903 in an edition of 750 copies. 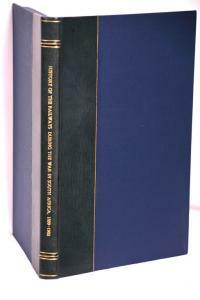 Boxed - blue cloth and half leather backing:- by Sangorski & Sutliffe - Zaensdorf.